If you have ever tried email marketing, then you must have heard about a tool named Mailchimp. It is an easy-to-use tool but it’s not the only solution in the market, and it’s not flawless for sure. Many MailChimp alternatives are available in the market having some much-needed features, which gives them an edge over it. Hence we compiled this article about top tested MailChimp competitors which can guide you in choosing the right tool for your email marketing campaigns. What does MailChimp Lack that you need? We tried and tested MailChimp from the perspective of doing an email marketing campaign and it had some amazing functions but somehow failed to fulfill some of our expectations. Here are some of the shortcomings that we faced while doing the email marketing campaign from MailChimp. MailChimp is known for it’s simple and well sought out features and whereas these features are mostly appreciated and welcomed but sometimes it happens that you want more. To run a successful email marketing campaign, you will need more complex and advanced features. You can add a level of automation to your campaigns with features like complex list segmentation, autoresponders based on user behavior, split tests, and marketing automation. When it comes to tracking, MailChimp provides pretty decent campaign tracking, and when we tried it we were pretty happy. 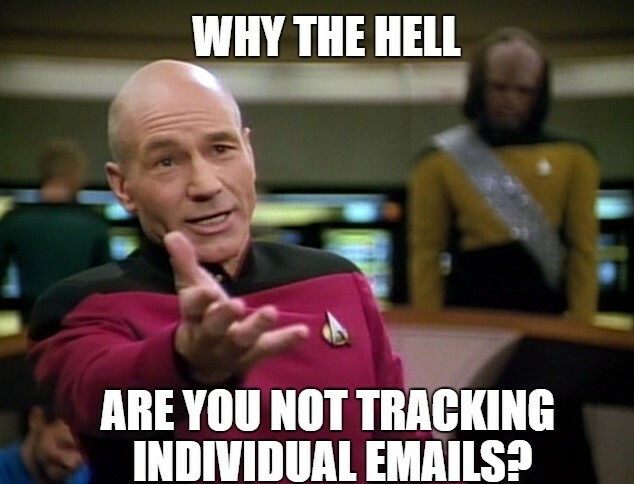 But MailChimp fails to provide individual tracking of emails, links or attachment. Many alternatives to MailChimp provide advanced tracking for campaigns as well as individual emails. With advanced tracking, you can track their browser information, the device they are opening your emails from and from which location as well. If you don’t like using a desktop app, then MailChimp is definitely not the tool for you. It doesn’t provide integration with your day to day email clients like Gmail or Outlook. But some tools will provide you with this flexibility and will seamlessly integrate with your day to day professional life. Many tools nowadays are providing real-time desktop notifications which can help you in taking quicker decisions which MailChimp doesn’t provide. This is their weakest point. MailChimp uses shared servers to send emails and this can easily land your emails in promotional tab and sometimes in spam box as well. Because of the shared server, your marketing campaigns might lose their importance if sent from MailChimp. Your emails might end up in your recipients spam box and hence your time and energy will be wasted. It might not seem like that, but MailChimp is quite costly when you have thousands of subscribers. Their free plan limits you to the number of emails you can send to your subscribers, and when choosing a paid plan, you are limited with the number of subscribers. Their cheapest plan will cost you 10$ – 20$ whereas some tools listed below as MailChimp alternatives that will give you services like MailChimp in the mentioned amount. Who should stick with MailChimp? A solution for free: People who are looking for a free solution then MailChimp is the perfect tool to go or stick with. They have some restrictions on the free version, but it gets the work done. An easy solution: People who are looking for a real simple and easy way to design good looking emails and newsletter to circulate then MailChimp is the easiest and a handy tool which you can learn in a couple of hours only. List Segmentation: It is another feature which has been perfected by MailChimp and if you have more than 10 lists then this is the perfect tool to stick with. It will give you better results and detailed analysis of your campaigns. Moreover, MailChimp provides email magnet integration, helping you build multiple lists. Detailed Reporting: MailChimp is known for delivering the most detailed reports covering 24-hour performance, top link clicks, top subscribers, and country wise analysis as well. We love this feature of MailChimp and the results it delivers. Before we go on discussing all of these tools in detail, their features and how they are different from MailChimp. Here’s a quick summary table, to give you concise data and an overview of the tools, which can help you a lot in choosing the right solution to move forward with. Marketers, Sales Representatives from SME and large corporates Complex User Interface Desktop app, Gmail and Outlook plugin. $79/mo for 1,000 users. (If billed annually) Perfect tool for inbound marketing and marketing automation. Best known for wide-range of integrations and multi-channel marketing automation features. Following this summary is a detailed description of the tools: what are they famous for and how they can prove to be the best MailChimp alternatives. SalesHandy is a complete email marketing tool. So, if you are looking for a tool dedicated just to your email marketing campaign, then this is the right place to be. Where as MailChimp fails to provide marketing automation, SalesHandy can prove to be the best alternative to MailChimp. This tool will help you customize and personalize your email marketing campaigns adding that personal touch. Moreover, SalesHandy guarantees email delivery right in recipient’s primary inbox as SalesHandy uses your Email service provider’s servers .i.e. Gmail or Outlook servers to send your emails and hence get you the highest email deliverability rate. This guaranteed delivery is also because you can send your bulk emails in drip .i.e. every consecutive email is delivered after a certain time gap, enacting human like behavior, to dodge spam filters and ensure that the emails land in the primary inbox and not in the spam box. Besides this amazing feature, SalesHandy also provides the feature of autoresponder .i.e. Automated follow up emails based on the recipient’s behavior. This feature will help you maximize the results, and with a detailed analysis of your campaigns, you will be ready to take the next best move for your organization. 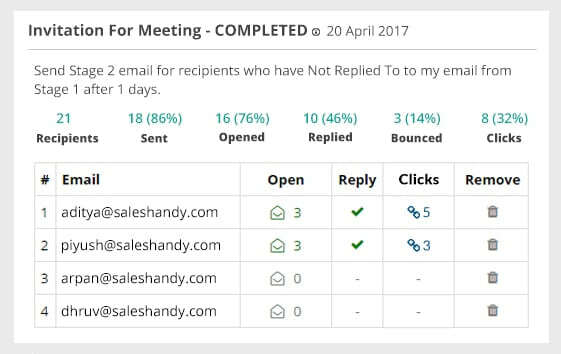 Email Marketers/ Online Marketers: SalesHandy can be a good fit into digital marketer’s day to day routine as it seamlessly integrates with your Gmail as well as Outlook accounts. Apart from mass emailing, additional features like free Email Tracking and Email templates can save a lot of their time and money. Sales Reps: This tool is perfect for Sales executives or reps who are looking to close more deals. Emails are still a big part of the sales process and what’s better than knowing when to contact your lead to close deals quickly. You can put your email campaigns on auto pilot mode and add more to your sales. Individuals, Bloggers, Freelancers: These people will love SalesHandy as it’s the most inexpensive tool out there in this category. You can easily spread out newsletters with HTML email marketing templates and Document tracking and get more traction for your work. SalesHandy Summary: So, if you you are looking for an inexpensive marketing automation tool then this solution is the perfect pick. Signup with SalesHandy for FREE! Get Response has all the features that MailChimp is famous for like A/B split testing, list segmentation, landing pages, drag & drop email composer, and many more. This is the one of the cheapest solutions on the list. The pricing of GetResponse starts from $15 per month and goes up to $1,199 per month according to the person’s or organization’s needs. MailChimp is known for its simplicity, but that’s where GetResponse takes over offering better landing page creator, CRM functionality, and exit intent pop-up. Even though GetResponse has some complex features, it’s user interface is sleek and fresh which makes it easier to learn and use. Another feature that we want to highlight here is GetResponse Landing Page Builder. The most commendable thing about their page builder is that it’s mobile-friendly. You can simply take your landing page to mobile and make the necessary tweaks using Get Response tool to end up with extraordinary landing pages that will get more conversions for you. GetResponse landing page builder works amazingly as illustrated in the video above. SEO Executives: This tool will be a bliss for SEO execs or people in SEO field. GetResponse tool will help you track overall conversions from your landing pages, and with the tool’s detailed reporting you will be able to make better and quicker decisions. Mid-Size Organizations: This tool can get the marketing team going in mid-size organizations and can affiliate different marketing strategies at the same time. It saves time, adding more to your day and make it more productive. With this MailChimp alternative, you can automate your marketing campaigns. Additionally, this automation tool listens to your campaigns and learns to give the best response to them. Convert your visitors into your leads using Active Campaign, with features like email segmentations, signup forms, split testing, dynamic content and many more. These are only sub-features of email marketing module, and there are other features which can add more perks to your marketing funnel. Active Campaign’s email marketing feature offers automation of your sales funnel, where your customer will be sent an interactive email after a certain period of his purchase. Individually, I love that active campaign can be used from your cell phone, and you can have marketing and sales automation right in your hand wherever you go. Additionally, drag & drop editor, free image hosting and free templates make it worth the money. Another tool which would be an excellent add to the marketer’s stack. Using this tool, you can focus more on your marketing qualified leads and weed out just plain visitors. Aweber is the most compatible MailChimp alternative with the same stack of features but with a better user interface and sleek visual email composer. Aweber provides you with 30 days Free trial where you can take a good look at the tool and get a good grip on its features. Using Aweber, one can send out professional-looking email newsletters and they can design it by themselves using their drag, and drop editor. And one can use their impeccable HTML templates as well. I loved their tagging feature which lets you create tags, and your marketing campaigns will act on the mentioned conditions. You can apply these tags to trigger a marketing campaign based on the open and click rates. Besides this, Aweber gives out feature like automated follow up emails where you can set email sequences to get the best of your marketing campaigns. Online Marketers: It is great for Marketers who want to automate their entire funnel and who are looking for a solution where they don’t have to make their newsletters from scratch. With Aweber’s features like automated follow-ups, HTML email templates, and email automation, you will be sending out the best ever marketing campaigns yet. People who are looking out for a solution that is available on desktop as well as mobile then Aweber is the best to get started with. Aweber has a whole Mobile app suite to offer you, and you will have all of your marketing campaign stats, subscribers stats, and their behaviors on the go. You can add new subscribers using Aweber atom app which is available for iOS and Android as well. Hubspot is an unusual add as it doesn’t have much common with MailChimp but it’s one of the best solutions for the people looking for marketing or sales automation tools. You can get started for free with Hubspot sales or marketing solution and pay as you go or use their advanced features like email sequences, predictive sales scoring, personalized email automation, email templates, and much more. It’s an all in one tool for the people who don’t have a sales or marketing funnel and are actively looking for a solution to these problems. Hubspot will do everything for you. From discovering new leads to connecting you with them and help you close more deals, HubSpot does it all. You can use Hubspot’s marketing campaigns and set automated follow ups to get more interaction and in result close more deals. Hubspot is best known for its email sequence feature which helps sales reps or marketers form that perfect campaign to send out to their prospects. And not only that, you can personalize your emails using merge fields which will make your campaigns stand out in the crowd. Content Marketers: This is the perfect tool to spread out your best work. You can use their Gmail and Outlook integration to make the most of your time. You can go for their marketing hub software and you will be a success for sure. Sales Reps: It’s a tool that will enhance your sales funnel, and add more value to it with features like live chat, meeting scheduler, multiple deal pipelines, contact and company insights and many more. Your sales will be over the roof with this tool. Sales Hub will be the best suitable HubSpot option for sales reps.
SparkPost is the only tool out there which is developer friendly and they are very proud of it. SparkPost effortlessly replaced Mandrill, a service provided by MailChimp for transactional emails, when they announced that people would have to buy fully functional MailChimp account to access Mandrill. Besides this, SparkPost is an efficient and productive tool with exceptional features like developer savvy templates to get them started with SparkPost, Powerful SMTP Injection and more than 35 real-time email metrics to take better and effective decisions. This MailChimp alternative is not only loaded with extraordinary features as mentioned above but will give a flawless data migration from Sendgrid, Mandrill, Mailgun and like. The best feature of this MailChimp alternative is their email delivery rate. They are known to have the best email deliverability which is a big problem when going for the MailChimp solution. According to Spark Post, around 25% of the non-spam emails are sent from their tool. SparkPost is the best solution for the people or marketers or sales reps looking for a MailChimp alternative, where their emails get delivered right in the recipient’s inbox and not the promotional or spam box. Developers: Not only it’s a standalone solution for the developers, but SparkPost has the perfect resources to get them on board like API documentation, sending emails through SMTP or REST and data migration. Developers can dig into SparkPost client library using their favorite languages like node js, python, PHP , java and many more. Aritic PinPoint is another full-stack marketing automation suite. It has all the features of MailChimp like email campaigns, Facebook ads, landing pages, and even signup forms. In addition to that, it has visitor tracking feature and offers anonymous visitor tracking using the browser fingerprinting technology. This technology helps users to track and monitor their anonymous visitors, launch re-engagement campaigns, and custom Facebook ads to convert them into potential leads. Other exclusive features include 360-degree lead profiling, account-based marketing, dynamic and deep-rooted segmentation, live automation workflows, advanced email filters, multichannel marketing automation, and integration with multiple email delivery servers. Aritic PinPoint offers dynamic segmentation, multichannel marketing, dynamic contact segment creation, a host of filters, actionable triggers, a wide range of integrations with mobile apps, websites, CMS, and CRMs; to mention a few. 360-degree lead profiling enables users to track, monitor, and nurture leads across the entire buyer lifecycle, using relevant lead magnets, forms, contents, video marketing, social media campaigns, etc. Aritic PinPoint is best suited for small and medium enterprises and large corporates with multiple hierarchies. Businesses looking to align their marketing, sales, and support team and increase the sales-marketing ROI, will benefit the most from Aritic PinPoint. Omnisend is a full email marketing automation suite that uses an omnichannel approach. Built with e-commerce in mind, this tool goes above and beyond what most email marketing tools can do. It provides a drag-and-drop email composer with several templates to help you build gorgeous emails in a matter of minutes. Email capture and list building are also easy with this tool, as they provide timed and exit-intent popups, landing pages, and gamified email capture forms. With Omnisend, you start off with pre-built and customizable workflows that you can use to automate messages for each stage of the customer journey. What’s more, these automated workflows aren’t limited to email: you can create a truly seamless experience by adding SMS, Facebook Messenger, web push notifications, WhatsApp, Google and Facebook retargeting ads, and several other channels. Automated workflows including email, SMS, retargeting ads, Facebook Messenger, WhatsApp and many more. Full integration with e-commerce platforms for easy behavioral targeting and ease of product recommendation. Customer segmentation and targeting based on shopping behavior, campaign engagement, profile data, and customizable fields. Gamified and dynamic email capture forms for easy list building. 24/7 support for anyone at any time. E-commerce marketers/digital marketers: as Omnisend is built for e-commerce, online merchants stand to get the most out of this tool’s powerful features. Beginners: Omnisend is accessible enough for those who are just starting out with email marketing, and offers features that are sophisticated without being too complex to use. Advanced marketers: While it’s certainly accessible, Omnisend is robust enough to create complex workflows and hyper-precise segmentation. The Pro plan is recommended for more advanced marketers to get the most from Omnisend. We all agree that MailChimp is hard to beat with its humongous client base and amazing features but nothing is perfect and people nowadays want advancement on a regular basis. And there are many tools that are out there with much-needed features and are advanced versions of MailChimp. So, which one of the MailChimp alternatives you are using? Comment below or Tweet us with your favorite, and if we have missed to mention it then we will surely review it, and add if it fits to be the MailChimp alternative.